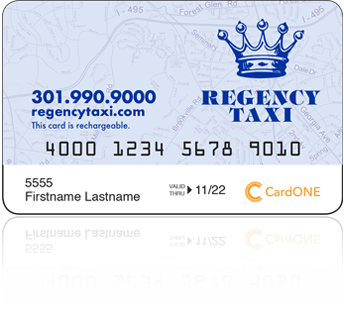 When you receive your card in the mail, you can load value to the card by visiting our website and clicking on the Regency gift card logo. From there enter your gift card number and the key code located on the back of the card. Make loading your card even easier by linking it to your bank or credit card. Once you start using your gift card, you will be able to access your card activity, balance, reload, cancel, report your card lost or stolen, and request a replacement, all from our website. In using your card, swipe once at the start of your trip for a card balance inquiry. Then swipe your card again at the end of the trip to process a payment. After payment, your card balance will display on the screen in the vehicle, and also print on the driver's meter. Please allow 5-7 business days for processing and shipping. Any unused balance on a gift card cannot be refunded or applied to a charge account or credit card.